Spend a Sunday afternoon at Interference Archive listening to records and discussing their sound, historical context, and emotional resonance. Everyone is invited to bring a song to share, either on vinyl or a portable device. There will also be records available from if a song could be freedom… to discuss, including records by Linton Kwesi Johnson, Sweet Honey in the Rock, Appalachian coal miners, Victor Jara, Bikini Kill, and many others! 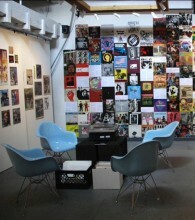 The exhibition’s organizers will be present to offer suggestions and anecdotes from music and social movement history. In an era and city where listening too often happens in the isolation of earbuds or closed apartments, we’d like to offer a space to enjoy and reflect upon music as a powerful social experience. Drop in anytime between 2:00 and 5:00 and bring a friend! Sounds Great. I may get to go. Question: will there be air conditioning or a fan? I was there a month ago and it was real hot.